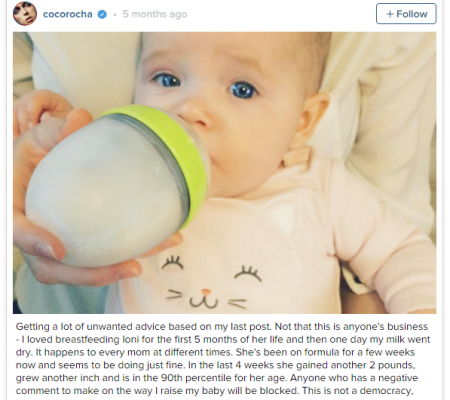 When Canadian model Coco Rocha received criticism for posting an Instagram photo that indicated she feeds her baby daughter formula, she put an end to the bottle-shaming with a strong follow-up post. While on vacation in Oahu, Rocha shared a screenshot of a text message conversation with the virtual assistant service GoButler about acquiring formula for her six-month-old daughter Ioni. While Rocha’s caption was an endorsement of GoButler, many commenters fixated on the fact that she used the service to acquire baby formula, with several responders criticizing the model for bottle feeding Ioni.